Carnival is celebrated with greater dedication in parts of Germany than in any, other European country. No wonder we wanted to experience it! After a late breakfast a group of four friends and I rode our bikes to Kehl. This is the bridge we took over the Rhine River which separates Germany from Alsace France. It is a time of elaborate parades, masks, balls and election of Carnival king and queen and official madness. I only got as far as wearing a multi-colored shirt but it was incredible to see everyone else so festive and in costume! One of my favorites from the public was this couple of... mops... genius :). The exact time of celebration and the traditions vary from region to region but it generally takes place in early spring, seven weeks before Easter. But in theory it actually it starts on the 11th November at 11.11a.m, although little more than backstage planning takes place before New Year. The parade, itself, was amazing too. Some masks were funny, others unnerving, and they even included some local traditions like capturing members of the audience... I'd personally be terrified had that been me in that cage. 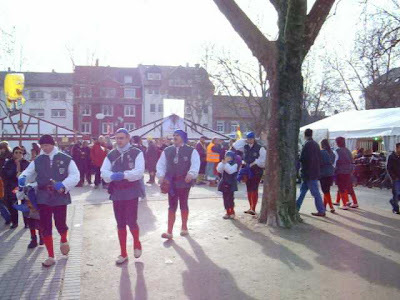 The festival itself is variously known as Karneval (Rhineland), Fassenacht (Mainz), Fasching (Bavaria) and Fastnacht/Fasnet (South West Germany), and the different names denote totally different forms of celebration. We tried to blend in at our Karneval celebration by joining the German locals and breaking out the beer ;). but even smaller localities put on their own celebrations, not to mention the many parties held in schools, youth clubs and places of work. ... I mean, just look at this guy, he definitely doesn't look very nice! In Germany, Mardi Gras is also referred to as the fifth and foolish season ('die närrische Zeit'). More information and the summary above can be found at the German tourism site - Events - Carnival. Yet there didn't seem to be a care in the world for anyone there! My friends and I loved the energy and excitement and by the end found ourselves chanting the German phrases that we still have yet to understand :). As it all died down our lunch was way overdue. But seeing as it was practically a holiday we felt that we deserved to be treated some more. And so we went to a small German restaurant and split a few desserts. My pick was a third of this Waffel with banana and ice cream and a hot Cappuccino to warm me up. Both were absolutely delicious and the perfect sweet end to an afternoon of fun. What a roller coaster of a weekend!